Spy fiction has been a popular genre for over 100 years. Tales of Bond and Bourne continue to fascinate audiences worldwide. Sometimes, however, the realities of the shadowy world of espionage can be just as engrossing. There is just one problem: finding out what actually happened. This is especially the case when writing about deniable interference in the affairs of others: intelligence officers know it as “covert action.” Covert action involves using spies to influence events in other countries. Highly controversial, it is perhaps the most sensitive—and secretive—of all government activity. Many countries engage in covert action. Most recently, Russia stands accused, among other things, of interfering in the 2016 US presidential election. Meanwhile, the US has a long track record of using the CIA to overthrow governments abroad. Israel has a reputation for particularly robust covert action against Arab states and terrorists alike. The United Kingdom is not immune. It has used covert action for hundreds of years—since before the United Kingdom even existed. Queen Elizabeth I used “covert meanes” against King Philip of Spain in the Low Countries by secretly providing funds for rebel fighters. The reign of her namesake, Queen Elizabeth II, witnessed a dizzying array of secret schemes to promote British interests as London’s international power waned. There are numerous ways to write secret history—and challenge government secrecy. Most importantly, more exists in the archives than people realise. These included plans to overthrow the Albanian government and undermine Soviet rule throughout Eastern Europe. The Foreign Office cynically hoped to provoke repression for use in Western propaganda. In the Middle East, Brits helped overthrow the Iranian government, planned to kidnap a Saudi Sheikh, colluded with allies to overthrow the Syrian regime (twice), and waged sabotage operations against Yemen. Even the Queen herself once suggested quietly slipping something into the coffee of a Middle Eastern leader. A lot of this was achieved using a top-secret MI6 fund, about which even the prime minister did not know. In the declining empire, psychological warfare teams plotted to spread fake epidemics so as to flush rebels out of forests. In Latin America, the Foreign Office turned to psychics to locate a kidnapped diplomat. Closer to home, the most senior levels of government supported risky undercover hit squads in Northern Ireland. They had few scruples about lying to the United Nations and Parliament. This is secret history. MI6 files remain classified and many of these operations are still not officially acknowledged many decades later. This poses a serious—if enticing—challenge to historians wanting a fuller picture of how the UK waged Cold War and managed the end of empire. There are numerous ways to write secret history—and challenge government secrecy. Most importantly, more exists in the archives than people realise. Of course, there is no neat “covert action” file series, but fragments dispersed amongst thousands of pages provide tantalising details. They often exist in what we might call parallel files. For example, MI6 budgets are classified but there might well be some hints in seemingly mundane Treasury files. Stumbling upon a diamond amidst pages of dust is a real thrill. An ageing historian suppressing the urge to dance a jig in the archives is not an uncommon sight. The wonderful National Archives, however, are no history supermarket. Writing secret history requires an expedition to as many repositories as possible—a great archival road trip. These include reading private papers held in universities up and down the country. One historian found British assassination plots against Syrian officials buried in a politician’s private papers that had been accidentally declassified in Cambridge. The Queen’s coffee remark, mentioned above, sat quietly for decades in a diplomat’s unpublished diary in Birmingham. This archival trail extends across North America. From the glamour of presidential libraries in Los Angeles—where, alongside tourists taking photographs of Reagan’s Air Force One, details of British involvement in the Iran-Contra scandal lie dormant—to the small-town romance of libraries in the mid-West. Fleeing hurricanes in the Kansas countryside may be a very real danger, but the rewards—such as uncovering Anglo-American collusion to overthrow governments—can be great. Skeletal documents can only take the historian so far. Interviews are vital. People who have “been there and done that” help put archival fragments in the right order. One of the great pleasures of writing secret history is meeting interesting characters in interesting locations, from sprawling Scottish estates to London’s clubland. Stories told over a brandy or two—many of which cannot be published—are a privilege to hear. Retired officials are often surprised about how much historians have uncovered, and struggle to hide their expression upon seeing a document in which he or she signed off a covert operation decades ago. Secret history can—and needs to—be uncovered. It is more than spy stories. We cannot fully understand state interaction without including the darker arts of international relations. Featured image credit: Shredder_mechanically_device by Stux. CC0 via Pixabay. Dr. Rory Cormac is an Associate Professor of International Relations at the University of Nottingham. A Fellow of the Royal Historical Society and a leading expert among a new generation of intelligence historians, he specialises in British covert operations and the secret pursuit of foreign policy. He has published widely on intelligence and security issues and regularly appears on radio and television. Cormac is the co-author of The Black Door: Spies, Secret Intelligence and British Prime Ministers and featured on Channel 4's Spying on the Royals. 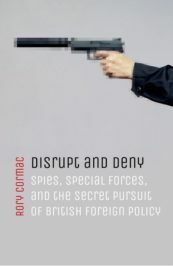 He is the author of Disrupt and Deny: Spies, Special Forces, and the Secret Pursuit of British Foreign Policy, published by Oxford University Press. It is possible to write such history, but the research is extremely difficult and time consuming. My research into the murder of FLQ (Front de Liberation du Quebec) terrorist Mario Bachand in Paris took over 5 years. See “Last Stop, Paris: the assassination of Mario Bachand and the death of the FLQ” (Penguin: Toronto, 1998), and see laststopparis.net. What I discovered about the special services and their ‘active measures’ is almost halucinatory. I am writing another book on related matters. I conclude that much history, particularly history that touches upon certain matters, is entirely and quite deliberately misleading. A state of affairs of which academic historians must be aware, but never address.